Reagan Houston, MS, PE, author and research chemical engineer was born in 1922 in Pennsylvania. 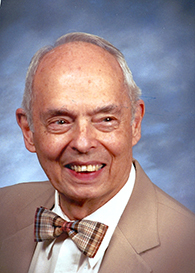 He graduated from Penn State in 1944 and 1947 with BS and MS degrees in chemical engineering. He worked in large and small companies and did consulting on air pollution control. He has authored several articles and two books on cancer, heart and stroke. He was diagnosed in 1997, at age 74, with aggressive prostate cancer. He accepted the diagnosis as a challenge, not a death sentence. His PSA, a measure of prostate cancer, had doubled to 8.1 in about 6 months. His Gleason score was 3+3 meaning early cancer. The doctor offered radiation but he refused because of its reputation. He chose temporary hormone therapy while he studied. As a professional chemical engineer, his life has been full of problems assigned to him without a solution. When his cancer appeared, he went to a support group. In their bookcase he found Linus Paulings’s Cancer and Vitamin C and shortly, a book by Abram Hoffer, Vitamin C and Cancer. Hoffer’s multivitamins plus temporary hormones have kept his cancer in painless remission for 17 years and continuing. He was asked to facilitate a prostate cancer support group. The more he studied vitamins, the more he realized that Hoffer’s therapy had helped him would help many others with practically all types of cancer. It also became apparent that vitamin C is excellent for treating widespread or metastatic cancer, when chemotherapy and radiation are almost useless. His self-assignment changed from how to control his cancer, to how to help people with prostate cancer and then to how to help all cancer patients use vitamin C without upsetting FDA and the state medical boards. His specific aim was to show cancer patients that painless therapies for cancer are available, even if doctors say, “Not approved.” His current assignment is to help all people strengthen their immune system to minimize cancer, stroke, and heart diseases. He joins many others in a mutual aim to bypass the political restrictions imposed by big medical companies and their friends! In 2010 he fainted twice, probably from low blood pressure. With a diagnosis of congestive heart failure, he received a pacemaker and diuretic pills. Since then he added acetyl-L-carnitine pills to Hoffer’s multivitamin regimen. As of May 2014, he does not have congestive heart failure. The cancer community has taken poor data on vitamin C for cancer therapy as fact and neglected the good data showing that vitamin C was effective at controlling most cancers. In spite of many objections, the cancer community chose profit over people! But cancer patients can chose their therapy to live longer with less pain. Patients can minimize heart disease, stroke, and the many other diseases just by choosing vitamins and other natural supplements. His literature review showed that good nutrition with vitamin C, other vitamins, natural supplements, diet and good life style could revolutionize health care in the US. We can cut the cost of health care in the US by bypassing the FDA. His aim is to educate patients and their friends. Hoffer’s vitamin C regimen is safe and effective toward most types of cancer. Big pharmacies and FDA do not like vitamin C for cancer therapy. We’ll bypass them. Vitamin C can be used during radiation and most chemotherapies. Vitamin C is effective against metastatic and widespread cancers. Vitamin C can be used by cancer patients now! Don’t wait for more tests. One third of cancer patients die in five years. His aim is to cut cancer deaths in half by 2018! Together we patients can do it!